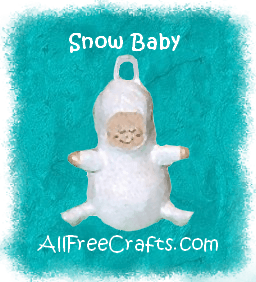 Use sculpey clay and a recycled refrigerator light bulb to make this cute snow baby Christmas ornament. 1. Take a small ball of clay and roll out for the face and attach it to the front of the metal part of the bulb upside down. 2. Roll out another large piece of clay, very thin, so that it will cover the entire light bulb. Starting in the center of the clay, put the rounded bulb part in the center and smooth out around bulb except around the face. Smooth the clay around the face so there is a small lip around the the facial area. 3. Roll out four small log shapes, making each one about ¾ inch long and ½ inch wide. For the arms, I used my nail, but any point will do, at the tip of the arms, go around the tip making a indent to form the rounded part of the hands. For the legs, just shape into a boot shape. Attach the arms and legs to the sides of the clay covered bulb then smooth out any lines made from attaching the limbs. 4. Roll out a small snake and attach it to the top of the snow baby as a hanger. Bake as directed, 225° for about 20 min. Remember that all stoves are different, so adjust the temperarture if necessary in your stove. 5. Paint the face and rounded part of the hands in skin tone paint and let dry. Draw on a simple smiley, sleeping face with the sharpie pen and a little bit of rose paint for the cheeks. 6. Paint the body, arms and legs with the glitter paint or paint with white acrylic and sprinkle with the ultra fine glitter. Let dry and enjoy!